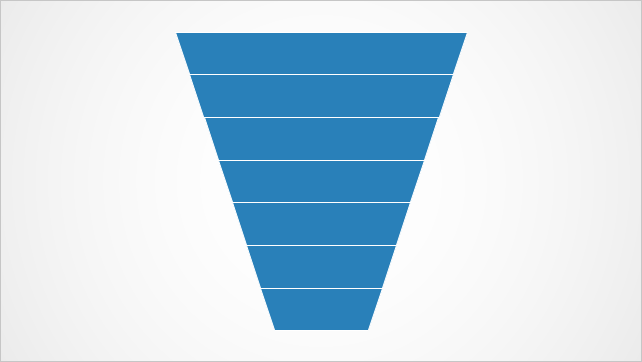 Funnel charts are a great way to visualize how sequential data can be broken up into different stages. 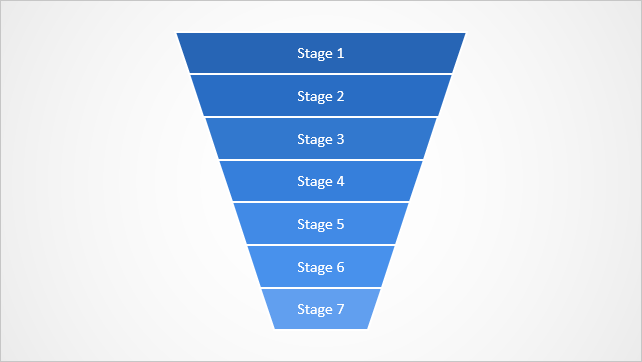 Unfortunately, the “Funnel” SmartArt graphic included with PowerPoint (Insert → SmartArt → Hierarchy) doesn’t reflect the hierarchical nature of the stages and supports only three inputs. 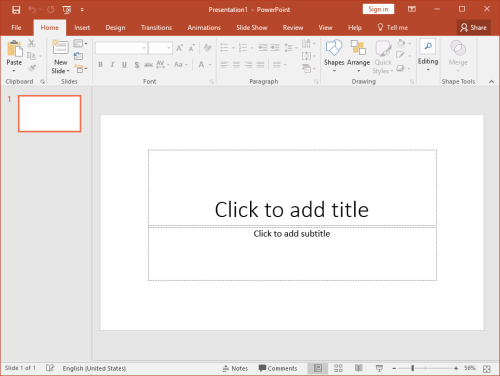 That’s why I decided to write this post to demonstrate how easy it is to make a funnel diagram from basic PowerPoint shapes; just follow the steps below. Add rectangle shapes (Insert → Shapes → Rectangle) that represent the stages of the funnel, like depicted below. Add a trapezoid shape (Insert → Shapes → Trapezoid); then rotate the shape by 180 degrees (hold Shift key while rotating), and resize it to match the height of the stage shapes. Delete the first/third/fifth/etc. stage shapes. 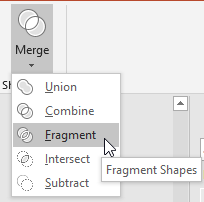 Select the first remaining stage shape and the trapezoid (in this order), then click on Format → Merge Shapes → Fragment. 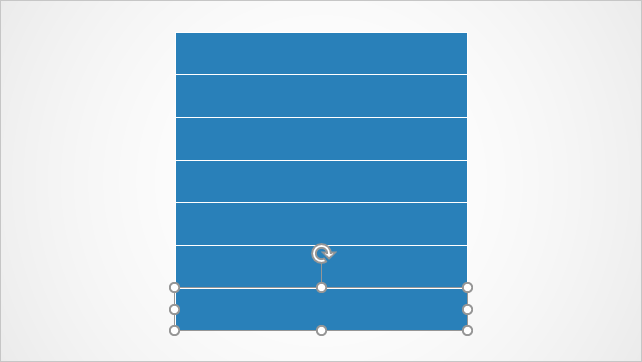 Repeat this step for the other stage shapes. Delete the shapes not needed for the funnel. Format the funnel shapes just as you like. You can download the resulting funnel chart from this link. The .pptx file also includes some more funnel variations with different numbers of stages. 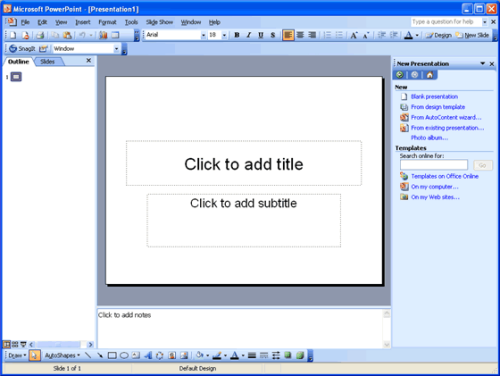 Right-click the rectangle and select Format Shape from the context menu. Select Fill → Picture or texture fill and click on Insert picture from → File... to choose an image file. Use the transparency slider to make the picture as transparent as you want. Switch to the Slide Show Ribbon tab. Click on Set Up Slide Show. 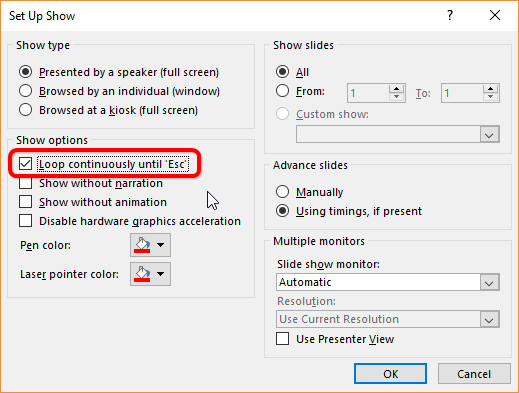 Tick the Loop continuously until 'Esc' checkbox. 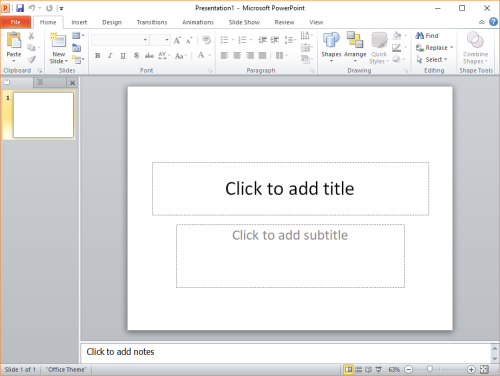 Select all slides in the navigation pane. Switch to the Transitions tab in the Ribbon. 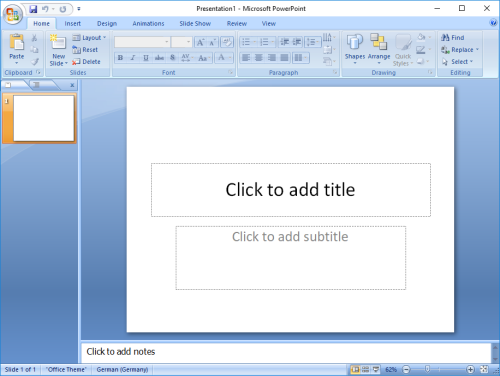 Enter the duration you want each slide to display. 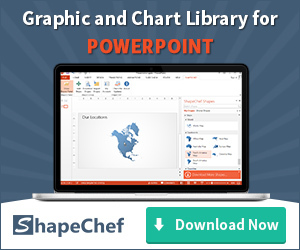 We have just released version 1.3.1 of ShapeChef, which you can download and install from this link. Updating is free for all current users. 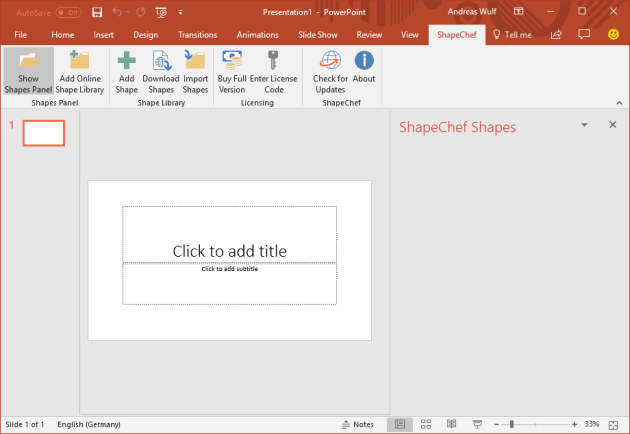 Version 1.3.1 mainly solves an issue with ShapeChef not being usable with the latest Office 365 Insider preview version of PowerPoint 2016 on Windows 10. 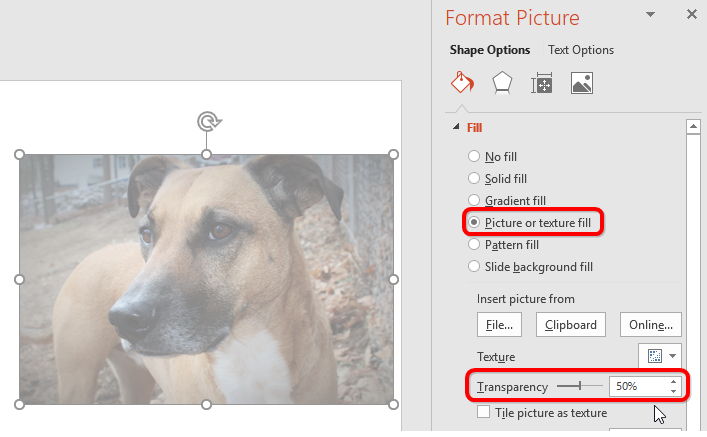 If you don’t see any content under ShapeChef Shapes (as in the screenshot below), please install this update to solve the issue. 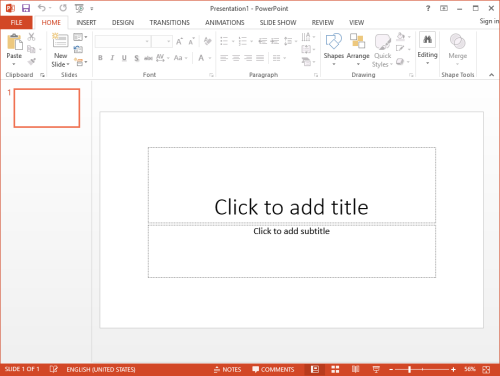 Fixed problem with content of shape library pane not being displayed in latest Office 365 Insider version of PowerPoint. Fixed minor user interface issues on systems with high-DPI settings.